The Washington Times published my review of Alex Berenson’s Tell Your Children: The Truth About Marijuana, Mental Illness, and Violence. Many people these days, it seems, believe that marijuana is a mostly harmless drug that helps to ease pain and relaxes people, like a good, stiff, alcoholic drink. But like alcohol, the effects of marijuana can be serious and even deadly. Alex Berenson, a thriller writer and former New York Times reporter, has written a book that exposes the myths of marijuana at a time when many politicians are pushing for nationwide legalization. 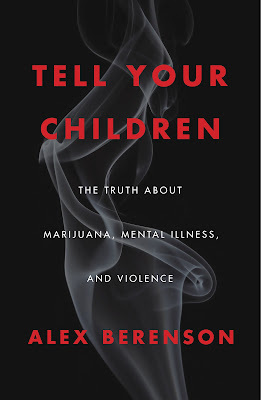 In “Tell Your Children: The Truth About Marijuana, Mental Illness, and Violence,” Alex Berenson warns that the chemical in marijuana that causes one to “get high,” 9-tetrahdrocannabinol, commonly called THC, can cause psychotic episodes that can end in violence. Mr. Berenson writes that the most important finding linking marijuana and psychosis is a 2017 468-page research report issued by the National Academy of Medicine titled “The Health Effects of Cannabis and Cannabinoids.” The study reported that marijuana does not appear to cause lung cancer. But the study offers less good news when it comes to mental health. The study found strong evidence that marijuana causes schizophrenia and some evidence that it worsens bipolar disorder and increases the risks of suicide, depression and social anxiety disorder. The higher the use, the greater the risk, the study concludes.